April | 2011 | Thy Glory O' Nigeria..! 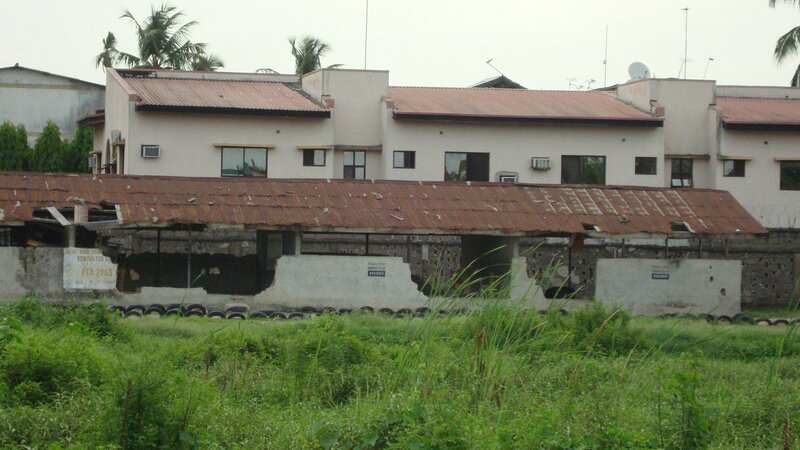 The images in this essay show what is left of Festac Grammar School on 41 Road Festac Town, Lagos. The first set of high school graduates from Festac Grammar School emerged in 1984. I have no concrete information about the general academic performances of the students that recently graduated from FGS. 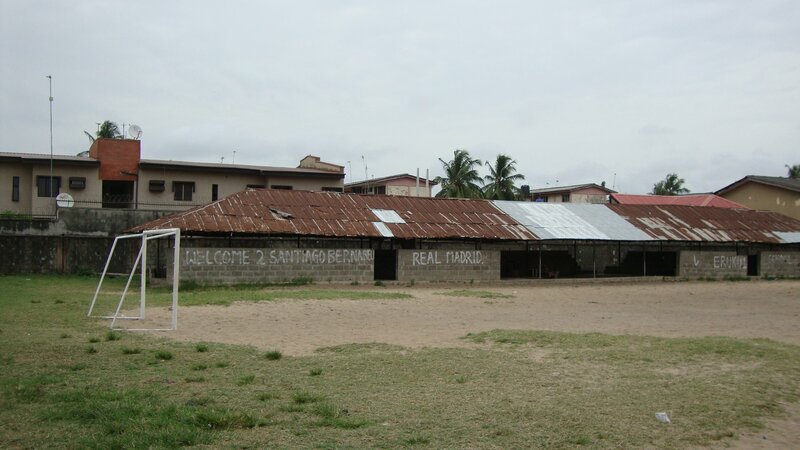 But in those days Festac Grammar School turned out some of the most brilliant minds in Lagos State. 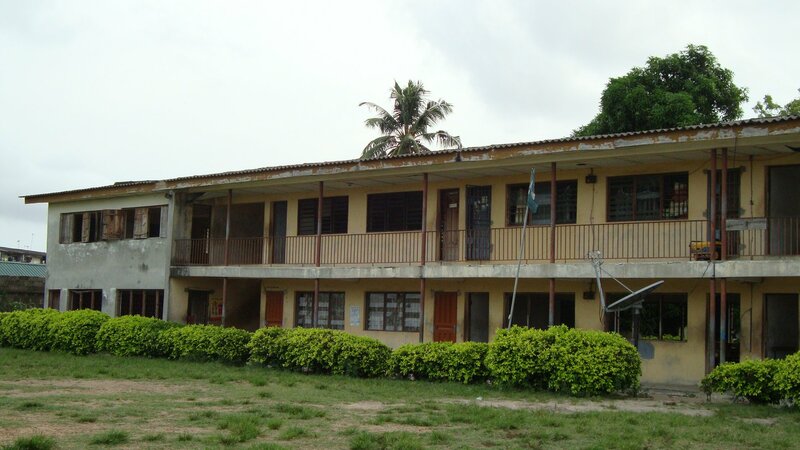 In 1987 and 1988 this school produced the best WAEC results in Lagos State. When I graduated in 1989 our results were also very outstanding, ranked among the best. 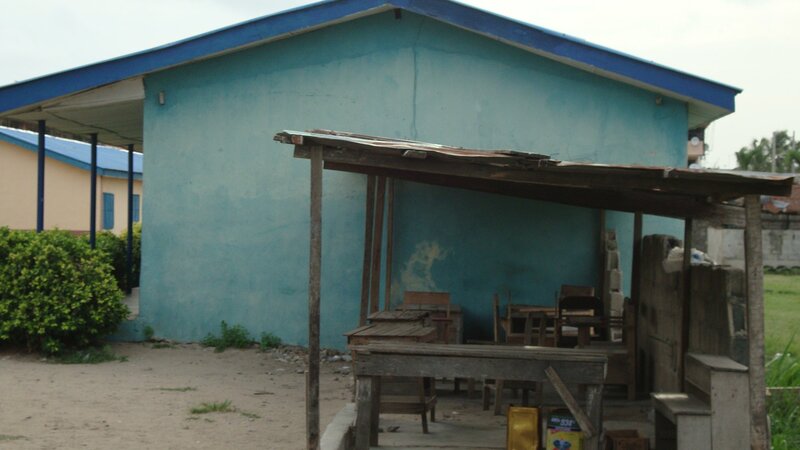 As part of the recognition of the high academic standard of FGS, the school was selected among the first set of schools in the (then) Ojo Local Government to have a prototype of the modern (one-storey) building. That was in 1984/85. 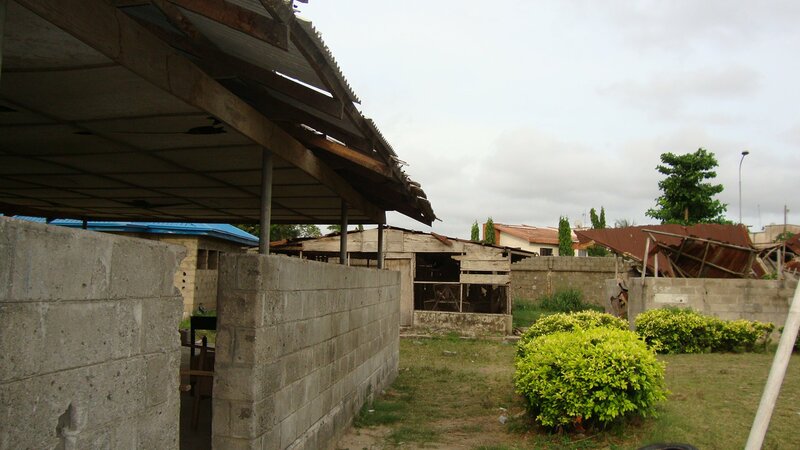 Unfortunately for reasons that we don’t know about, that prototype was the only new structure to have been erected in the school since it was established in 1980. FGS is now under Amuwo-Odofin Local Government. 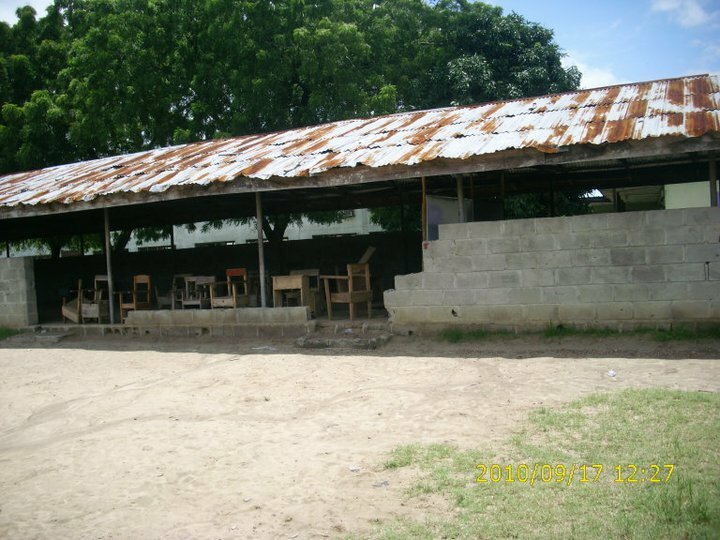 Whilst all the other schools in Ojo and Amuwo got new brand school structures FGS was left with the poultry-like structures. 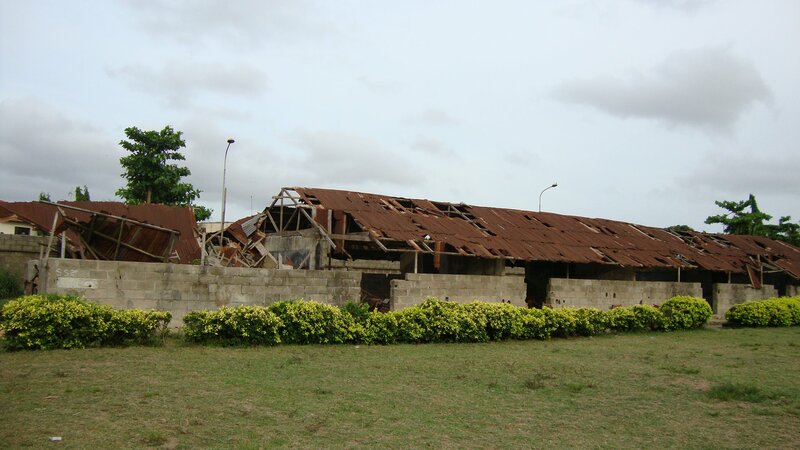 It remains one of the greatest mysteries of Lagos State Ministry of Education how a school that got the first prototype structure in the old Ojo Local Government was left to rot away totally. Fast forward to 2011, we now have an Alumni Group thanks to Facebook. The group is new but very vibrant and will be making official complaint about the present state of the school to both the Local Council and the State Government. This essay is my personal contribution and an addition to the other avenues and efforts that the Alumni group will be working on. 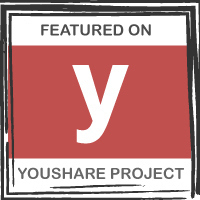 I have told the group about my intention to put up a personal essay to tell the story. It is not a unique story because public education is almost a thing of the past in Nigeria. But it must be told anyway. 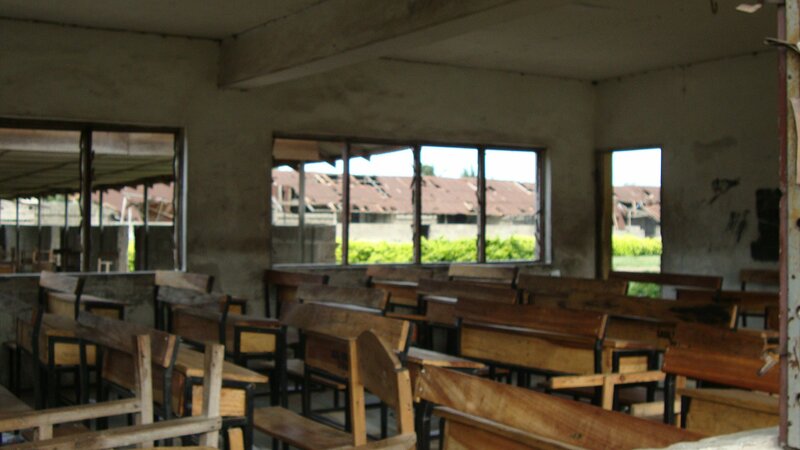 Just to be sure, I will also continue to post or repost the same message on my blog until the Lagos State Government, the Lagos State Governor and the Local Council step in to save the future of the children attending this school. In essence this for me is now a struggle. I will work actively in the alumni group and sustain this awareness until we accomplish our goals which are to restore FGS and to motivate the students the best way we can. The Alumni Group will not relent on the momentum it has gathered from its recent general meeting. 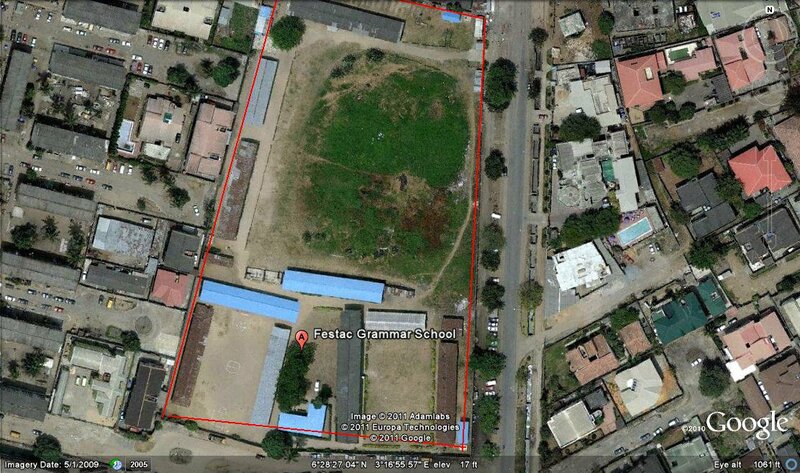 I am aware there are plans to start with projects and activities that will rescue Festac Grammar School. The task is enormous but we believe that we can achieve some positive changes. 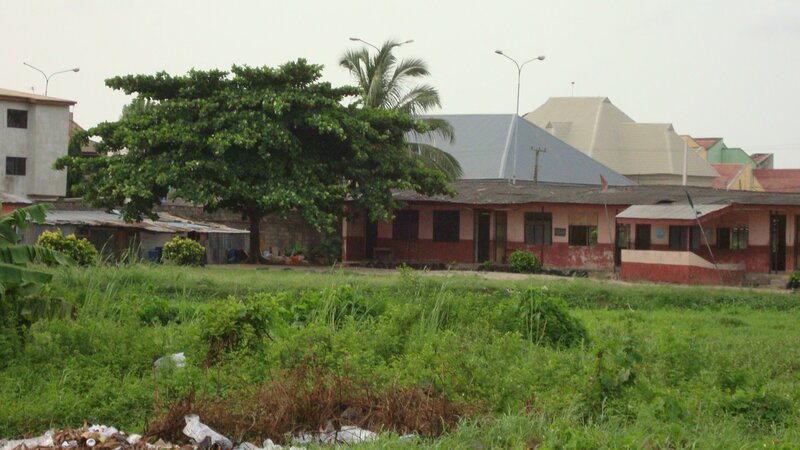 The school has since been divided into two; The Senior Secondary and the Junior Secondary which are under the State Government and Local Council respectively. The Alumni Group will engage both tiers of governments in tackling the hurdles facing both schools. In our days it was one school and we still see it that way. To make Nigeria great again, we must re-invest in education and bring back the glory days. Education is the right of all and it must be made available and affordable. The environment where learning takes place has a crucial role to play in forming the minds of the students. Governor Fashola, congratulations on your re-election. There is no time to rest. Please save my alma mater and all other schools in Lagos. Eko O Ni Baje O..! 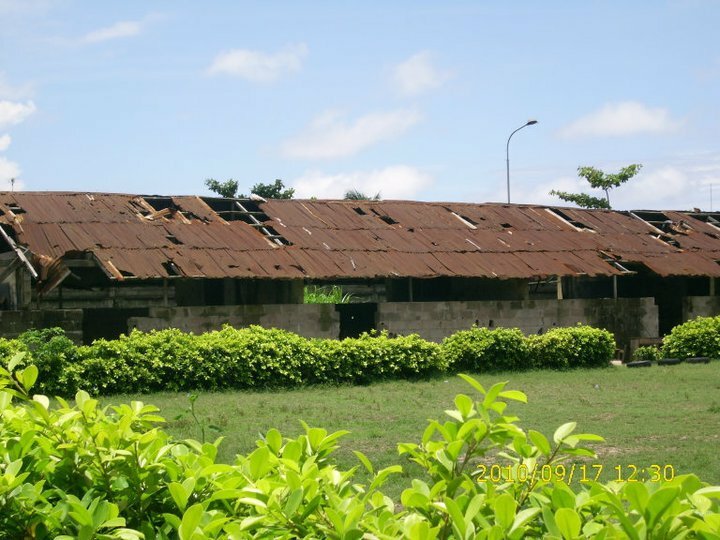 I have written this article to bring awareness to the rot of Lagos schools and to sensitize the Lagos State governor on the need to fix my alma mater and all the schools in Lagos. Let no one be deceived, this story will continue to appear on my blog regularly. This is now a cause. This is a struggle for all the old students of Festac Grammar School. I will continue to post this story at least once a month until something is done by the state government. Nothing will separate me from this struggle as long as I have life in me. Oluwafisayo Oyeromade Ogunjimi Orilambo for your enthusiasm and support. There was a court injunction issued recently in Nigeria that the Electoral Agency should rearrange the election time table to what it was pre-2003. That is the presidential election should be the last in the sequence of elections. But INEC and PDP preferred it the Obasanjo way in which the presidential election is conducted before governorship election. Even common sense dictates that the biggest should be saved for the last. The riots, violence and terrorism that trailed the presidential election of April 16th have now put the forthcoming governorship election into jeopardy. In the North of Nigeria more than 48 000 people have been displaced. The real figures could be higher. Youth corpers that have been used as cheap labour for the last voting process have been murdered and the rest of them are unwilling to continue to take the inherent risk especially in terror-prone Northern Nigeria. Prevention is always better than cure. INEC disregarded the court injunction and PDP preferred it this way. Now we are at this point where no one knows what is going to happen on the 26th of April 2011. Already elections have been postponed by two days in Kaduna and Bauchi. What type of miracle will bring about accelerated changes that will ensure that elections can hold in these states where people have been slaughtered like lower animals? The security of lives and property are not guaranteed and we want people to leave the comfort of their homes to go to the polling stations. It’s easy to predict a low turnout across many parts of the nation. Those who voted for the PDP in the last elections were marked for extermination in Bauchi and Kaduna. 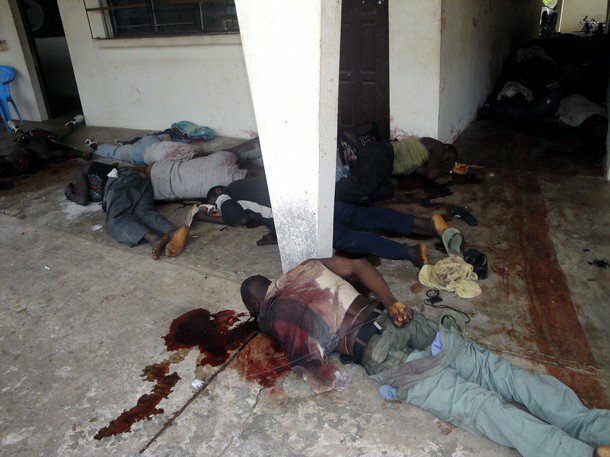 Many were killed even by uniformed men who went from house to house to slaughter them. One of the mysteries or myths of terrorism in Northern Nigeria is the role of real/ fake uniform men who raid homes and commit genocide. It will happen again. There are many questions and arguments on my mind. When the season of elections are over Nigeria and Nigerians really have a lot of internal cleaning to do. It is time to scatter things and re-arrange them like we used to say. It is certain that a substantial part of the North is against the Jonathan presidency. Why not give the north their North and their candidate? Must Jonathan or anyone for that matter be the president of Nigeria? Let them have their groundnut pyramids to cater for their needs. Give them their region and their candidates so they can go back to their agriculture to sustain them. Give them their freedom so that they can stop killing my brothers and sisters. What stops the East and the West from going back to their original life styles and means of sustenance? What is holding each region back? They should be set free again. Nigeria had regions pre-1966, why is it impossible to go back to that arrangement? These questions and many more are what the disjointed people of Nigeria should be seeking answers to when the dust is settled. If Nigerians don’t answer these questions there are many more days of genocide ahead. Uncountable and unnecessary acts of terrorism will continue to be unleashed on innocent people especially the Christians and southerners living in the North. Retaliations there in the North and elsewhere in the South may escalate to the point of a new civil war and Nigeria may eventually disintegrate in a violent manner even before the predicted 2015 date. The level of ignorance and illiteracy in Northern Nigeria is a bad omen for one Nigeria. Why the rest of Nigerians shy away from these obvious facts beats me. Nigeria will undergo Apoptosis if we want. But if the people of Nigeria disregard the situations and signs, Necrosis is a much fatal option. The signs of the last few weeks point to the latter and remind Nigerians of 1967. I want to forget this week as quickly as I can. This is one of the saddest weeks of my life. 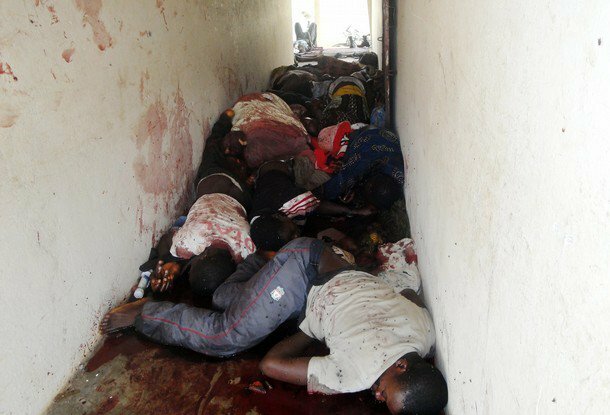 This week, several Nigerian youth were massacred across Northern Nigeria. They are graduates who were serving under the National Youth Service Corp Program. In one situation about 50 of them were locked up in a building and burnt alive. I take no pleasure writing down these horrific lines. There are some corp members who even left their comfort in Europe to go and serve in Nigeria and they died in the process. These are irreparable losses. Families are left to weep and count their losses. This is a national tragedy. Terrorism has gained a firm root in Northern Nigeria and southerners are sacrificed from time to time in these ugly situations. Gooduck Jonathan has said that the attacks were premeditated while M. Buhari stated otherwise. The bottom line is that Nigerian government is weak and slack when it comes to protecting life and properties. Premeditated or not, the attack could have been nipped in the bud if the country has efficient internal security systems. What we have is a system where offices are duplicated and everyone is leaving the job for someone and no one ends up doing it! I have complained earlier in a recent post that it is absolute stupidity to have a minister of Internal Affairs plus a Minister for Police Affairs plus an inspector General of Police. In the case of riots or terrorist acts as we now see in Northern Nigeria, no one knows where the order to quell the upheaval is to come from. Should it come from the Presidency through the Internal Affairs? Should it come from the state governor through the Inspector General of Police? Where and how does a Minister of Police Affairs come into all of these? Another sad dimension to it is that the real culprits are probably walking free. I can imagine random and indiscriminate arrest of people who are probably not connected to the crimes. Almost all the acts of terrorism in Nigeria fetched no known perpetrator(s), save for the Boko Haram guy who was arrested and killed in police detention. So in that respect the system needs a total overhaul. RIP Adefemi Olubayo, (13 August 1985 – 18 April 2011). Nigeria’s football star Adefemi Olubayo, I just want to say Rest In Peace. I’m still trying to find words to express my sadness and sorrow. This is another sad story on top of the series of sad stories from Nigeria this week. You were already a shining star. You’ve played for Nigeria at 3 different levels and just recently made your entry to the senior team. I’m too sad this week to write more about your deaths and those of the Nigerian youth, women and children slaughtered in Northern Nigeria. All of you, mMay your souls rest in peace. I still hold on to my views about how elections should be conducted in Nigeria. There is still a need to establish permanent workable electoral processes that will avoid wastage of funds, and on the side, lives, every four years. Whether they like it or not Nigerians must establish electoral processes that will bring about unquestionable outcomes. Until such a time that votes cast can be checked against a social security number or identity card numbers, Nigeria may never experience a peaceful electoral process. One of my friends called me naïve because he thought Nigeria is too complex for such ideas. How can any country be complex or complicated for progressive ideas? Ten years ago, who could have thought that Nigerians would be using ATMs or VISA cards? But they are using them quite efficiently. So why would it be impossible to issue IDs and security numbers? It will take time but it is a course they must take. All their options and short cuts are resulting in arguments and waste of lives and property. Many Nigerians will argue that the last presidential election was fair, free and peaceful. They have valid points. But to term the post-election violence as an expression of frustration is an understatement. There is no smoke without fire. Some Facebook commentators have argued that the North can break away for all they care. It is not that simple and easy to solve the problems. Some people are arguing for regional governments, that even makes more sense. Now to the just concluded presidential elections in Nigeria. There are insinuations that the elections have been rigged. It is one thing for elections to be free and fair. It is another thing entirely for the elections to be credible and to hold water. When results are counted at polling stations, they are usually in hundreds or a few thousands. But when they are announced by INEC, they are in millions. The idea of register, vote and protect, in my opinion, remains meaningless if not senseless. The only thing that can be protected in any election anywhere in the world is the number of forensically identifiable individuals. I know several Nigerians who are not voting this year. Those who have registered at “convenient venues” like places or work or familiar environment could not vote because they are not allowed to move outside their residential areas on election days. One thing is that it is very primitive to restrict movement of people on election days. The other thing is that when Nigeria has adopted the system I suggested in previous essays people will be allowed to vote even before the real Election Day. In that case no one will be disenfranchised if restrictions to movement are enforced on the last day. One of the commonest mistakes that election riggers make in Nigeria is that while they rigged election results, they usually forget the number of registered voters in some states or communities. The smallest of errors in an election outcome gives room for doubts and questions the integrity of the conductors. Sincerely, it does. It is hard to believe that any particular candidate in the presidential election will gather more than 90% of votes in any state of the federation. But Jonathan got 99% of the votes in some states. This is a very obvious error on the part of the manipulators and riggers. That one candidate can gather between 90 – 99.6% in any state of the federation ought to be investigated and scrutinized closely. All the electoral materials from such states should be surrendered to independent panel for verification. But do they have anything that is independent in Nigeria? Buhari said he is in possession of evidence that can prove that INEC computers were pre-programmed to deliver the winning ticket to the PDP. He also said he has some questions for INEC regarding some results. No one can doubt that computers can be programmed or re-programmed. If truly Buhari has made this claim and if he has the evidence why not produced it/them immediately? He should also be asking all his questions now using the appropriate medium/ media. The situation in the North cannot be allowed to continue unabated. 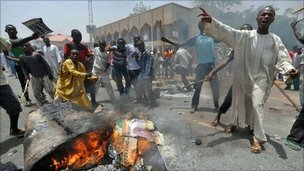 Riots have broken out in Northern Nigeria, People are dying, houses, churches and offices are being torched and burnt down. Supporters of PDP are the targets and it is easy to predict that the next targets will be southerners living in the North. The riots in Northern Nigeria are condemnable, and very unnecessary. It once again shows how divided Nigerians are and it gives more weight to the argument that Nigerians should divide the country and let every region goes its separate way. This is a complicated resolution and civil wars may break out in several regions. Nigeria remains a volatile country. Nigerians don’t know yet who ordered these riots but they do know that the rulers or elders in the North are slack and slow. They are watching as their territories are set ablaze. How low are their mentalities? What is Buhari’s position concerning these riots? Can he go out on the streets and call his supporters and street gangsters to order? There are ways to seek redress and he cannot allow the morons that are on the loose to destroy his reputation. They have already. I looked at the table of election results and I conclude that though the elections were relatively free, they are far from being credible. 90% of votes in one state going to one candidate is suspicious, 99,6% is definitely a fabrication or a figment of someone’s imagination. The results justify the billions of naira that Mr. Jonathan had siphoned from the Nigerian economy to ensure that he wins. Money remains the number one influence in Nigerian elections. Even INEC surprised itself and the bookmakers because I am in shock as to why Jega printed re-run papers. One day in Nigeria votes will be counted genuinely like we did in 1993 when MKO Abiola won the freest and fairest election ever in the history of Nigeria. Meanwhile Jonathan and Sambo must stop the violence in the North. The celebrations are over and, as the rulers of Nigeria; they have a first major assignment on their hands. Ghana’s GDP has been reviewed upward (USD 31.5) representing a growth of 75%. What is interesting is that the new figure reflected the contributions of both the service and agricultural sectors. The Ghanaian government is looking into other areas of her economy where changes and development can be made. Ghana recently started extracting oil. Ghana is preparing for a future full of hopes and abundant blessings. Three generations from now, the children of Ghana will be living the dreams of their fathers and mothers. What a beautiful people and country! This means that Ghana is probably the real and true giant of Africa. Democracy is working in Ghana. In Ghana there is a sense of collective nationalism and citizen responsibility. Ghanaians are building Ghana and making it not only the envy of West Africa but the continent as a whole. In the 1980s the Nigerian Government chased the Ghanaian community out of Nigeria. The infamous “Ghana Must Go” was xenophobia of the highest order in which Nigerians falsely ascribed their economic misfortunes and rising unemployment rate to the presence of Ghanaians in Nigeria. It was a detestable political move. Nigerians have no shame at all. Today a few decades after Ghanaians left Nigeria, Nigerians are now the ones hustling in Ghana. For several reasons majority of Nigerians have chosen Ghana as their favourite spot in Africa. Others prefer the so called SA. There are thousands of Nigerian students in Ghanaian Universities not for exchange reasons but because the useless successive, corrupt governments in Nigeria have done almost nothing to improve education. Many Nigerian politicians send their children to school in Europe and America. Ghana has also been added to the fanciful list of options. They destroyed the system in Nigeria and send their children and families abroad to school. Nigerians have also chosen Ghana as the hotspot for honeymoon. Several other Nigerians visit Ghana as part of their annual holidays. Nigerians are among the largest number of tourists in Ghana. We chased them out of Nigeria and now we are going to their country to admire them. What a failed country, Nigeria! Nigerians should thank Ghana and Ghanaians for not being hostile. Ghanaians are not xenophobic like Nigerians. They welcome us while not even referring to how we humiliated them out of Nigeria in 1983. Ghanaians have a forgiving spirit which typical Nigerians lacks. The racism/tribalism Nigerians faced in Nigeria is worse than what they face in Europe and America. This is probably why some Nigerians living in Europe and America also find it more convenient to return to Ghana for holidays as well. Nigerian businessmen are finding Ghana a more comfortable environment to do businesses. Electricity and other infrastructure are much better in Ghana. But not all Nigerians are doing clean businesses in Ghana. I have read and seen images of Nigerian fraudsters (419 guys) arrested in Ghana. There is a near complete absence of electricity in Nigeria. The monies budgeted for electricity in Nigeria was stolen by all the government officials in Nigeria and individuals lIke Obasanjo and Abdulsalami are involved. They awarded themselves contract for electricity even though they knew they have no idea what electricity is or how it is produced, managed and distributed. But they are free men and mentors to late Yar Adua and Jonathan. Nigeria is ruled by crooks and thieves and so no real progress is seen nationally in the areas of infrastructure and basic amenities. It is only in Nigeria that contracts for roads maintenance and repair are given to traditional rulers! In fact it doesn’t matter who gets the contract for Benin-Ore Road for example, the point is that the road is never repaired. Everyone who gets the contract just pocketed the money. Nigerians are dying in vain and hoping in extreme vain as all. Ghana has her difficulties and like the rest of Africa remains a dumping ground for dangerous electronic items. There are potential dangers because the poor and the desperate are exposed to the harmful components in these electronic wastes. But the government of Ghana is responsible and well aware of the problems. There is a plan and a system that is working towards genuine eradication of poverty in Ghana. In Nigeria the country is in the hands of gangsters largely aided by an irresponsible followership. In Nigeria the people do not understand the meaning of failure and they do not know what the essence of life is all about, therefore a corrupt party can produce any kind of candidate and still win a majority votes in elections that are usually rigged or manipulated. The sense of nationalism and collective responsibility is reflected in all aspect of the Ghanaian life. The most obvious is in the area of sport. Ghana is now the most famous sporting nation in Africa courtesy of her exploits in football in South Africa in 2010. Generally Ghanaians have shown that where there is a will, there is a way. Ghana has shown Africa that democracy can work and that there are dividends of democracy. In Ghana a few people are not looting to the detriment of the population like the way the PDP is championing looting in Nigeria. There is accountability and probity in the government of Ghana. Ghanaians that have been abroad have been able to help transform Ghana right from the community level to the federal level. They have introduced some systems in Ghana that are adopted from the Swedish communal system. It is working and progress is being achieved. Many Nigerians abroad are not suggesting how Nigeria can be improved; they are collecting bribes and stolen monies to support useless political parties and candidates. Nigerian politicians and rulers only go abroad, open their mouths, admire structures, buildings, take tourist photos and return home to boast of their exploits. They have no sense of direction that they need to improve Nigeria to the level that they see and enjoy when they visit abroad. In several cases of stupidity they bring raw cash and buy properties abroad. 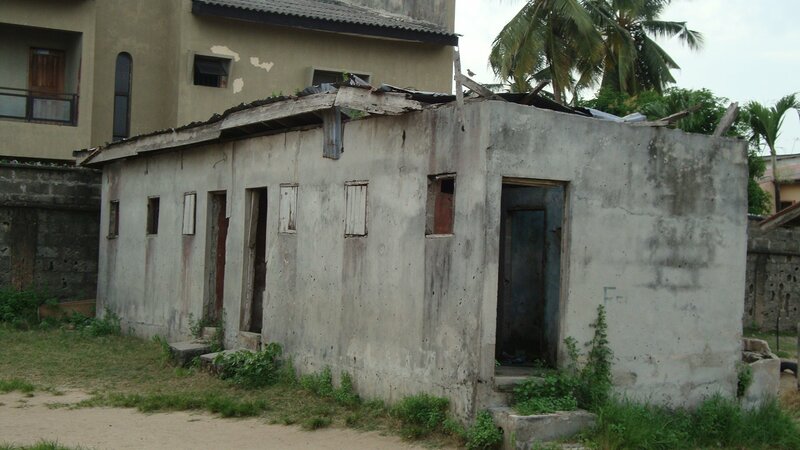 Some individuals buy properties that could have been used to provide housing for an entire state in Nigeria. This is how stupid, senseless and idiotic some Nigerians are. Yet they have admirers and followers. In recent time when Nigeria gave orders that Ivory Coast should be invaded, following as a puppet in the order of Sarkozy and Quattara, Ghana stood back as the father of Africa and opposed the invasion. War Crimes have been committed in Ivory Coast in the name of the United Nation, Nigeria and France. It took Ghanaians to bring the images of massacre to the world through a well-documented and organized protest. Ghana knows what the future is all about and as a country she is preparing for it. Ghana since the days of Rawlings has never acted for the moment. Rawlings and Kuffour never acted for the moment. They love their country and acted for the future. This is what all Ghanaians are doing. A leader showed the way and they have never looked back since. They are imbibing the spirit of Nkrumah, one of Africa’s best known nationalists. If Nigerians can look beyond the moment and make their institutions work, one day they will know that as far as this world is concern Nigeria is nowhere to the found on the map of nations/country with sense and purpose. We conduct questionable elections like they were done more than 2000 years ago. We vote or support a 12-year old failed party and we think it’s ok! We celebrate corruption and ill-gotten wealth in the name of God. Our institutions are dead and quality public education is totally absent. I can count in a thousand ways why Ghana, rather than Nigeria is the giant of Africa. May the spirit of Ghana fill the whole of Africa. Each country in Africa needs to fight one more war. I am not talking about civil wars. We will not fight any more civil war if each African country raise her nationalists above impostors and fight the common enemy once and for all. The common enemy in Africa is the Imperialists which are usually in most case the remnant or debris of colonial rule. Several African countries are independent only on paper but never in reality. In both political and economic terms, several countries in Africa remain under the imperial reign of countries like France, Britain, Italy, and the US and so on. African nationalists who have stood up to challenge the situation have been murdered by these wicked countries who usually call themselves the International Community. Those of us who are not afraid of death, because we realized that it is the necessary end for all men, must continue to restate the obvious. All the useless western countries must get out of Africa, and this dream will come true one day whether anyone likes it or not. Ivory Coast, Libya, Nigeria, Cameroon, Burkina Faso and the rest countries in Africa will exist beyond Obama, Cameron, and even the war criminal Sarkozy. Ivorians should raise their heads high and tell the world what France is doing in Ivory Coast. Before the latest massacre orchestrated by Sarkozy and Quattara France had its grip on the economic fortunes of Ivory Coast. France steals the economic resources of this country and this is the main reason why Sarkozy cannot let Ivory Coast be. The war crimes committed by both Sarkozy and Quattara are only partially related to the electoral dispute in Ivory Coast. The point is that Ivory Coast is not yet an independent country. If it was France would have removed all his bases, troops and institutions from Ivory Coast. Again the truth is the French never left. For several years Nigerians believed that the British influenced the political situation in Nigeria. They still do. It appears that the present ruler in Nigeria tilted more to the US than Britain. Who knows? He is probably not comfortable in being aligned with the imperialists that has always supported everything and anything from the north. Time will tell. Africa and Africans cannot afford to remain cowards. African countries are still in slavery. The independences have not been won. As a result even China has infiltrated Africa to continue the story of economic slavery. The nightmares of African countries have now been extended. History books and folklores abound of the deaths of our heroes and nationalists. They kill us and they walk free because a few among us are so stupid and shortsighted they don’t see the need to stop the slavery and foolery that our great-grand parents fell for. I know that one day, in my life time, or long when I’m gone through whatever means, a generation will rise up to re-establish the sovereignty of the African nations or countries. We can definitely not continue this way. 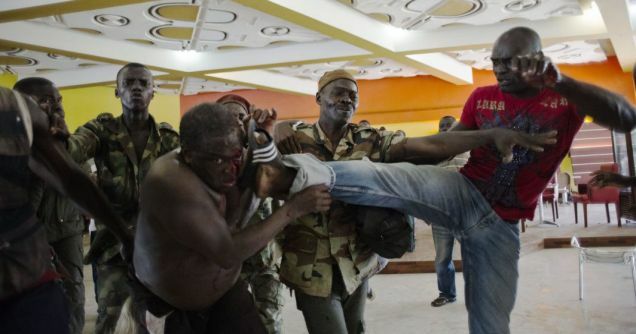 Our nationalists are not perfect people and they do make mistakes like Gbagbo for example. But to replace them with murderers/ puppets like Quattara is a negation of the struggles of our heroes past and present. The dictators in Africa and other parts of the world that continue to follow or listen to the imperialists are enjoying their evil reigns while those who tried to break free are removed by force. When MKO Abiola won elections in Nigeria in 1993 he was denied his mandate and no one came to his rescue because he made demands that the International community must pay for slavery and misrule. He died in a Nigerian prison under the watch of Americans sent by Bill Clinton. Those who want Africa to be free are murdered on African soil by the imperialists and their agents. Some of us will be targeted far from our motherland. Death is the end of all men but slavery is a crime against humanity. Africans must fight this last war, the one that will use FORCE to send all the colonialists and imperialist packing out of Africa. If I was an African leader today, I would sponsor everything within my power including diplomacy and force to send French packing out of Ivory Coast. We can start from there and start to solve our problems by ourselves. We are not fools. We have only been set-up against one another by these external forces with bases on our soil. Ivory Coast needs to be granted independence and we can start by ordering Sarkozy and France out of Africa. 2011 Election Rigging in Nigeria, These Women Should be Arrested and Sentenced Immediately!!! Watch this video and see what PDP is doing in Nigeria. They are now set to repeat this useless feat on saturday for the presidential election. The women in this video should be arrested, prosecuted and sentenced ASAP. Hopefully the results of such an election should be cancelled. This is what I meant when I mentioned in previous posts that the INEC chairman is just one person and he can’t even supervised 2 voting wards!